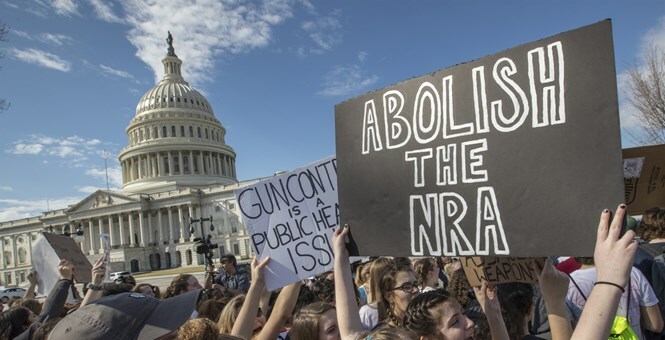 BLACK REPUBLICAN BLOG: They Don’t Hate The NRA. They Hate You. The progressives are cranking things up to 11 on the Stupid/Psycho Scale, which is good for us in the short term – some of us Normals were growing complacent and the midterms are coming. But we also need to open our eyes and accept the bitter reality we face. We can’t just pretend the truth is not the truth because we wish it were otherwise. The left’s dropping of its mask has demonstrated once again the undeniable fact. The left hates you. And then there is the new meme, that the NRA is a “terrorist” organization. This means you are a “terrorist” simply by advocating for your political views. Think about that. Labeling your political opponents as “terrorists” – gee, that can’t end badly. Violence against and suppression of terrorists is okay, isn’t it? And when this ploy works with guns, it will happen with the next right the left wants to take from us. How’s that blood on your hands? Sure, you were thousands of miles away, and your AR-15 – like the 14,999,999 other AR-15s out there – never shot up a school, but just believing in the Second Amendment makes you a non-human. Those of us who know something about history know that the people leftists regard as non-human always tend to end up non-living. Crazy talk? No. Don’t be gaslighted. They will tell you exactly what they want for you if you give them long enough. The beauty of social media is these creeps just can’t help themselves; you just have to have the strength to listen and accept the truth no matter how unpleasant it is. Many of them want you dead – again, they will tell you outright. Others will be satisfied with you just being serfs, unable to participate in your own governance, obedient, working hard to fuel the liberal redistribution machine that pays off Democrat constituencies. To the fields, flyover drones! Grow our kale, drive the trucks carrying our cucumber-infused pale ale! We are to be the silent stagehands in the urban hipster play that is their lives. Understand that the left doesn’t hate the NRA. The NRA stuff is a distraction. Leftists are dumb, but they understand the power of the NRA is really the power of millions of Normal Americans coming together to defend their right to protect themselves, their families, their communities and their Constitution. That’s why they fear it. That’s why they can’t abide it. They want your voices silenced. And the left doesn’t hate guns either. In fact, the progressives fully intend to be the only group left with any guns. That should turn out great for us. At best, the government that they promise will protect us will make excuses why they can’t see red flags waving and why they can’t be expected to actually protect us. Liberals have just come out foursquare in favor of police cowardice; their argument is you don’t need guns to protect yourself, and you certainly can’t expect a Democrat-run law enforcement agency like the Broward Sheriff’s Office to protect you because that would be scary to the poor government workers. You can’t protect yourself, and in return, no one from the government will protect you either. That whole outliving talk looks more and more sinister every day. Your life means nothing to them, just as the lost lives in Chicago mean nothing to them. There are several Parklands a month in the Windy City, but the Democrats who run it don’t care. They know where the bad guys are. They won’t act. Instead, they feign concern over the children because faking outrage will help them do what they really want done. That’s why you had them arguing that the idea of a cop actually doing his job was crazy. yourself and preserving your rights. You understand and accept the truth, which many allegedly on our side refuse to do because the truth is too harsh and painful. America is divided not between groups with differing political views held in good faith, but between Normals and a left that hates us. That’s not a pleasant notion, but to pretend that this is business as usual, that we are just friends with a slight disagreement, or that there is some reasonable compromise to be had, is delusional. Ask them. They hate you. The first step is the political battle. Wake up – the midterms are coming and we need to ensure that these people do not gain the power to undercut our rights. At CPAC, President Trump demonstrated that his competitive nature is in full effect – he intends on winning. We need to do the same. Volunteer. Donate. Activate. Yeah, it’s a hassle. We’d all like a pause to this constant cold warfare. The second step is the cultural battle. The left is intent on mobilizing the corporations that form the infrastructure of society against us. We need to respond with our own political power, and that means casting off the tired shackles of an ideology that assumes we are in a pure free market scenario. “Free market solutions” don’t apply where companies instead act based on political ideology when choosing to exercise political power; how, exactly, do we respond to a company that acts against us but decides it doesn’t care about the market consequences? Well, we can’t – unless we use our own political power. Georgia refusing to give Delta a tax break – which it should not have gotten in the first place – is the template. If they want to declare a cultural war on us, let’s give them one. It’s not how you or I want it to be, but it is how it is. Maybe pain will motivate them to re-adopt the old rules. The third step is to create deterrent facts on the ground. Demonstrate your commitment to your rights by joining the NRA and, further, by buying guns and ammunition. Tyranny is not out of the question – hey, aren’t they always calling Trump Hitler? Tens, even hundreds of millions of armed American Normals provide a deterrent to the kind of insanity we’ve seen the left hinting at. Be prepared to protect the Constitution, and the chances of them getting violent will diminish exponentially. Remember, they don’t want to fight; they prefer we give up under a barrage of hectoring from CNN and vicious tweets about how we hate children. But it is how it is, with leftists who makes no bones about what they think of you. And you need to act accordingly. Delta airlines just lost a $40 million tax break in Georgia after making the decision to pull long-held discounts from NRA members. The decision from Delta came last week, prompting the Georgia legislature to take a close look at the tax breaks being given to the company. Today, they voted to take it away and the governor is likely to sign it. 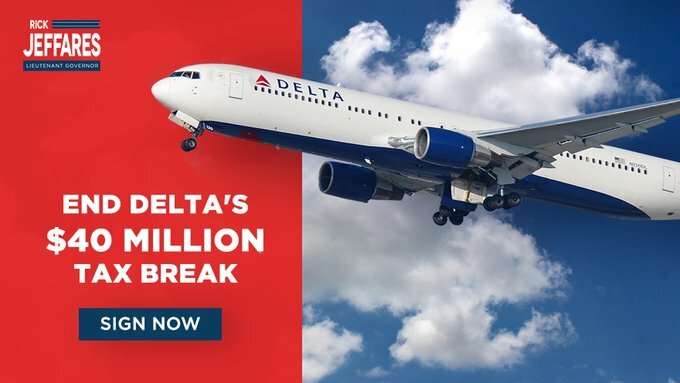 If Delta is so flush that they don't need NRA members hard-earned dollars, they can certainly do without the $40 million tax break they are asking GA taxpayers for. Delta claims the move was made in order to take a "neutral" stand on the gun control issue, but came after a number of companies caved to pressure from anti-gun groups to cut ties with the civil rights organization.